I have a pet peeve. And a blog. Match made in Heaven! I know language evolves. I like that about it, actually. But the way the word “Luddite” has evolved seems disrespectful to me of the original Luddites, who I learned a lot about while researching In for a Penny. 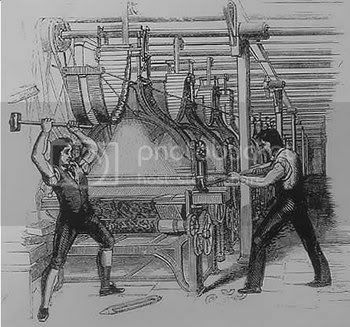 The Luddites were a social movement of British textile artisans in the nineteenth century who protested—often by destroying mechanized looms—against the changes produced by the Industrial Revolution, which they felt was leaving them without work and changing their way of life. These people weren’t opposing technology on philosophical grounds. They weren’t superstitiously afraid of the coming time when the robots would rise up against their masters and enslave them in return. Nor were they simply stubborn and old-fashioned. They were losing their jobs, and there was no provision at all made in the shifting economy to absorb or retrain them. The textile industry was changing rapidly in this era. 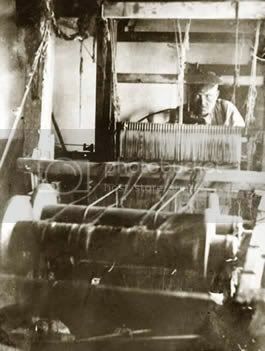 Before the Industrial Revolution, skilled weavers worked out of their homes (their cottages, hence, “cottage industry”) in rural areas, using hand looms. Then new machines were invented that moved weaving into factories in new industrial cities, and required only low-paid, unskilled labor to run them. 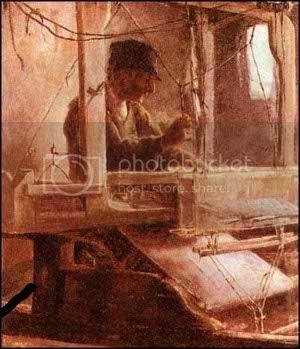 [The textile industry] went into crisis in the early 19th century, when economic depression at home and the loss of export markets in Napoleonic Europe and Revolutionary America hit hard. Wage cutting was endemic in the industry, and many workers suffered drastic hardships as wages fell or failed to keep pace with rising prices. A parliamentary committee investigating the situation in 1812 heard that wages were on average one-third lower than they had been in 1807 and before. The workers’ distress was exacerbated by at least three other factors, including the practice of payment in truck [my note: basically the “company store” system]; the introduction of cheaply produced low-quality stockings known as ‘cut-ups’; and the possibility of hiring juvenile and unskilled laborers owing to the lapsed apprenticeship laws, which flooded the labor market and further depressed wages in a practice known as ‘colting.’ The use of new wide weaving frames, which weavers were forced to rent from their employer or from an independent entrepreneur, often at exorbitant rates, also had its part to play in the industry’s degradation. […]Between 1780 and 1830 workers were reduced from comparative prosperity and independence to crippling poverty and complete dependence on their employer. Smaller, similar acts of violence to framebreaking happened all over England, directed against new technologies that threatened working families’ ability to make a living. In Penny, the 1816 rioters fired the elder Lord Bedlow’s barn with the new threshing machine inside of it. New threshing machines eliminated an entire large income source (threshing with the flail) for agricultural laborers; I’ll talk about that in another post. During the early 19th century, the Combination Laws prohibited trade union activity or collective bargaining for British workers. They weren’t repeated until 1825, and even then union activity was severely limited by law. Requests for changes in company policy backed up by property damage wasn’t a great or safe system, obviously. But anything more orderly and official was equally subject to legal repercussions and much less anonymous. The framebreakers, of course, were not successful. They lost, and they were punished. The offense was originally punishable by up to 14 years transportation. In 1812 the Frame Bill was passed, making it a capital crime. The framers of such a bill must be content to inherit the honours of that Athenian law-giver whose edicts were said to be written not in ink but in blood. But suppose it passed; suppose one of these men, as I have seen them,—meagre with famine, sullen with despair, careless of a life which your Lordships are perhaps about to value at something less than the price of a stocking-frame;—suppose this man surrounded by the children for whom be is unable to procure bread at the hazard of his existence, about to be torn for ever from a family which he lately supported in peaceful industry, and which it is not his fault that he can no longer so support;—suppose this man—and there are ten thousand such from whom you may select your victims—dragged into court, to be tried for this new offence, by this new law; still, there are two things wanting to convict and condemn him and these are, in my opinion,—twelve butchers for a jury, and a Jeffreys for a judge! The day John Henry died. The Luddites couldn’t possibly turn back time or get rid of the new machines. The British economy was changing and growing so rapidly that it was no longer practical for farming and textiles to be done the way they had been; more needed to be produced faster and cheaper to support the growing population, and specifically the growing urban population. Technological progress can’t be stopped or held back just because it changes the economy. Machines make our lives easier in so many ways. Why should someone have to weave cloth or drill steam by hand when a machine can do it? Why should someone have to spend their life in a factory when their job can be done by a computer? But that doesn’t excuse the employers who leveraged new technologies to erode the established rights and wages of workers, or who exploited newly created groups of workers. And when technological advances happen without any provision for what’s going to happen to the people whose jobs are being replaced (or paid significantly less), you can’t blame those people for being angry. This was really interesting! Thanks for sharing it.